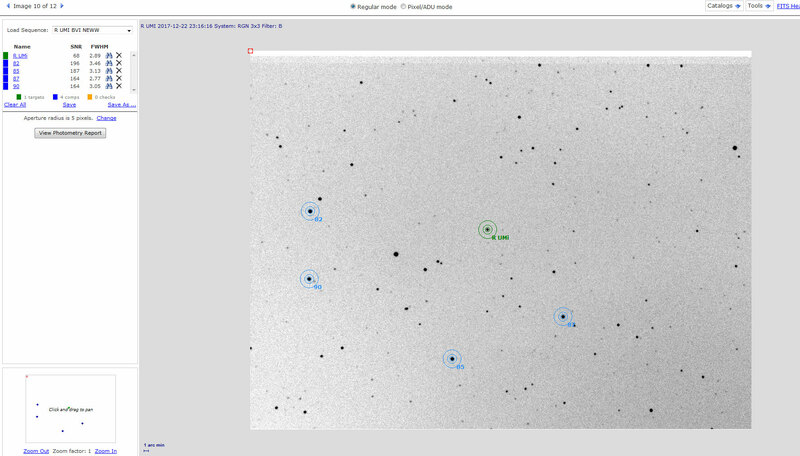 I have uploaded some images to do the photometry as usual. Although I can load the star sequences when selecting individual images I am getting an error when selecting two images for the transformation. The error reads: " Invalid sequence. There has to be at least one target, one comparsion star and one check star in the sequence." Any idea? Thank you for your support. I know that you are a regular VPhot user and if I read your post correctly, my comment below will not help. BUT, this occaisionally happens if one of the two images is faint for some reason (B filter with thin clouds) and the comp/check is not recognized. 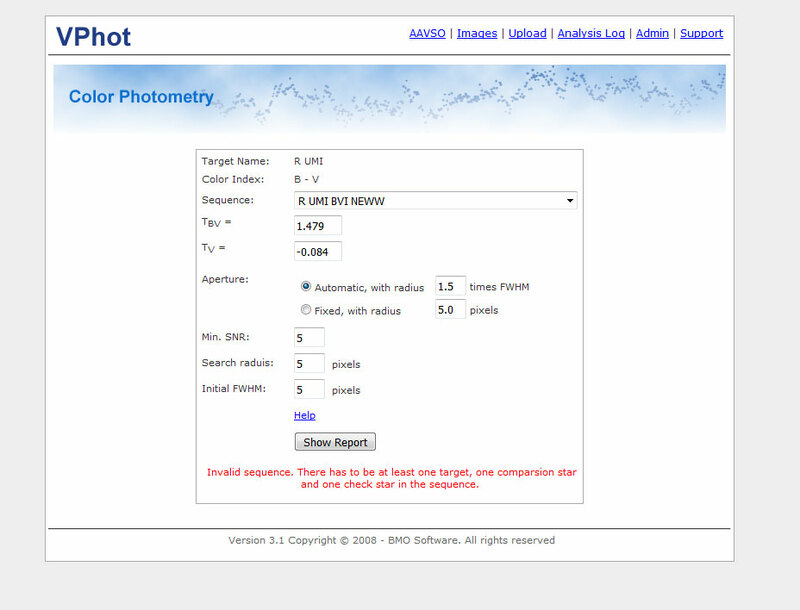 Also check the min SNR value on the color photometry page versus your normal image SNR setting value. If this is not the case, please share the two images with me at MZK and I will look too. although last night I experienced some thin passing clouds the SNR of all stars (comps and variables) is above 20 (with a single exception at 19). 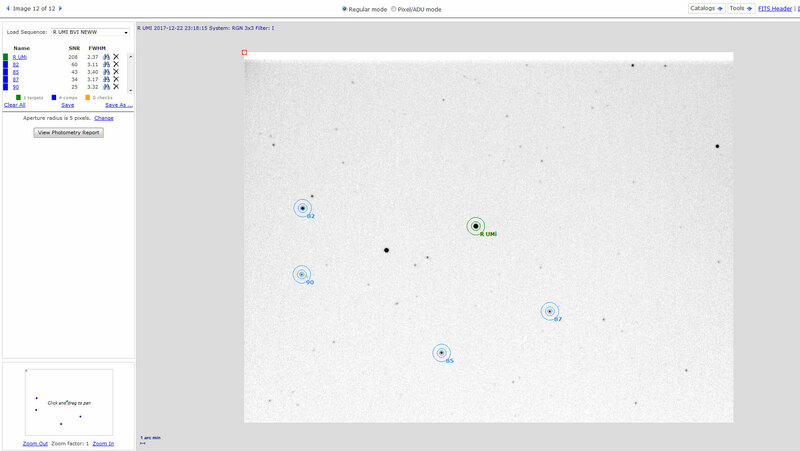 Changing settings in the SNR of the color photometry page does not help. I share the images with you for your looking. I got both your R UMi and Y UMi images to work. I needed to create a sequence for these stars since I had not observed them before. I got them from the normal AAVSO comp tool. I ran the transform of the BV Y UMi and VI Y UMi images without issues. I ran the transform of the R UMi images with an observation. The screen stretch of the BV R UMi images was unusual. The image background was very dark. Some flat issue? I ran the transform of the BV R UMi without issues. I ran the transform of the VI R UMi images with issues. I needed to open the I image and select a different check star than I had set up on the V image. I then saved this revised sequence. In this 1 second I image the original chack was too faint. 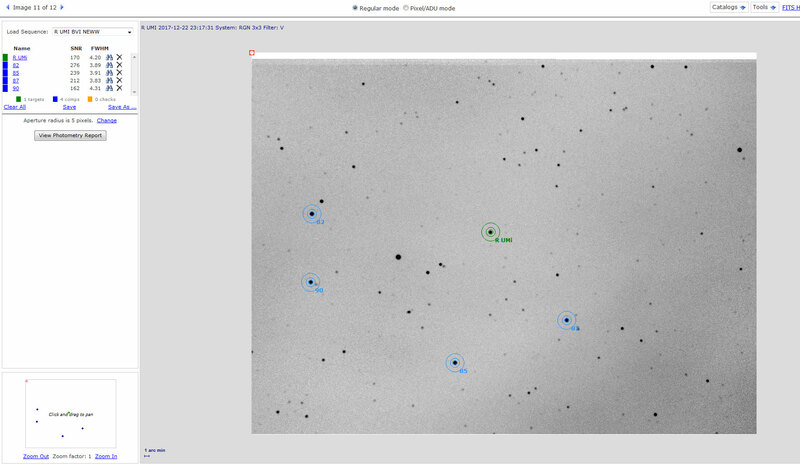 I also changed the SNR setting on the color photometry page to 5. So, I think my proposed reasons for failure are correct. Try a revised sequence and settings and see if that solves your problem? No progress so far. I have also created a new sequence. Altough I can correctly load variable and comps in each frame I am unable to do the transformations (see screen shots in attachment). I have also noticed that R UMI B and V appear extremely dark in VPHOT so I had to adjust the parameters under "Image display" (though VPHOT loads all stars with no problem if no trasnformation is required). In Maxim the two images have a normal appearance, however. I have also reloaded the two images into VPHOT just in case, but this experiment has been of no avail (still the same error). In the new sequence I have forgotten to get a check star. That could be the issue. I am modifying the sequence to see if that is the issue. The missing check was of course the culprit. I have now solved the problem.